As temperatures rise in many regions around the world, plant species whose ranges were previously limited by low temperature thresholds and intolerance to freezing are increasingly able to expand into new areas and possibly overtake established vegetation regimes. On Hog Island, an undeveloped barrier island off the coast of Virginia, a group of LTER researchers at the Virginia Coast Reserve (VCR-LTER) found that the woody shrub M. cerifera generates its own microclimate, slightly warmer than the ambient temperature. This adaptation allows it to endure cold periods that would otherwise limit its growth and promotes expansion in a positive feedback loop. In addition, modeling the growth of M. cerifera revealed that this microclimate feedback can produce a dramatic shift from grassland to shrubland with even a slight increase in minimum temperature. Many factors, including overgrazing and fire suppression, have been proposed to explain woody plant encroachment worldwide, but the role of climate warming and microclimate feedbacks in facilitating woody expansion has remained unclear. Hog Island provided an ideal site to evaluate woody shrub encroachment, as the site has been relatively free of direct human disturbances since the 1930s. Despite this lack of human presence, the shrub has continued to expand its range since the 1980s. The Virginia barrier islands of which Hog Island is a part sit at the northern limit of the range of M. cerifera, making them highly suitable for studying how this cold-intolerant shrub is able to persist and expand locally, despite freezing temperatures. The researchers found that the interaction between microclimate conditions in shrublands and general climate warming can induce a dramatic shift in ecosystem state from grassland to shrubland dominated by M. cerifera. The microclimate effect that they observed was enough to bring temperatures above those that would normally damage the shrubs. 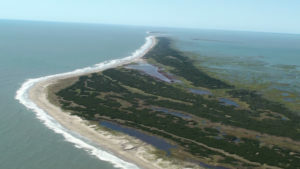 As the climate warms, the heartier woody shrubs on barrier islands may overtake grass species, resulting in decreased plant diversity, and potentially increasing an island’s vulnerability to sea level rise by preventing the natural migration of the island. The findings from this study provide an explanation of the potential mechanisms behind the emergence of two stable states (shrubland and grassland) in vegetation dynamics on temperate barrier islands. The study also advances scientists’ ability to predict how ecosystem stability on barrier islands may change under future climate change scenarios, providing useful knowledge for barrier island management and restoration.